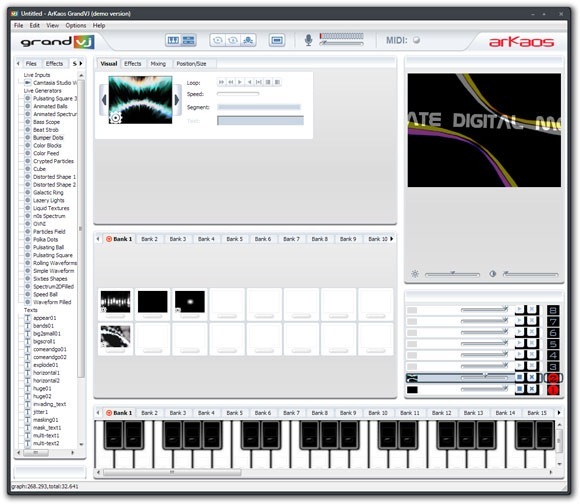 The successor to ArKaos VJ, a staple in early VJ application history, is nearly here. GrandVJ just hit public beta. GrandVJ is a complete, from-scratch rewrite of the app, with some new features — but still a nod to the simple, one-screen interface that made the original popular. You can now download a working demo, beta build (with some watermarks on output and other limitations) for both Mac and Windows. I have to say, I like the music keyboard interface and drag-and-drop-everywhere philosophy. At the very least, this could become the beginner-friendly VJ app a lot of people have been looking for. (That is, if it’s successful, I may have an answer for the "where should I start with VJing for something simple — and I don’t have a lot of time" question I get a lot, particularly on the music side.) It’s also got some generative and Flash-playing tricks I’ll be looking into. At the same time, I think it will be worth some constructive criticism. This field is also getting crowded — and users more demanding.